Fenbendazole is a broad-spectrum anthelmintic for infections caused by micro-organisms susceptible to fenbendazole, e.g. Ostertagia spp., Trichostrongylus spp., Haemonchus spp., Bunostomum spp., Trichuris spp., Cooperia spp., Nematodirus spp., Oesopagostomum spp., Strongyloides spp. and Dictyocaulus viviparus and Dictyocaulus filaria. 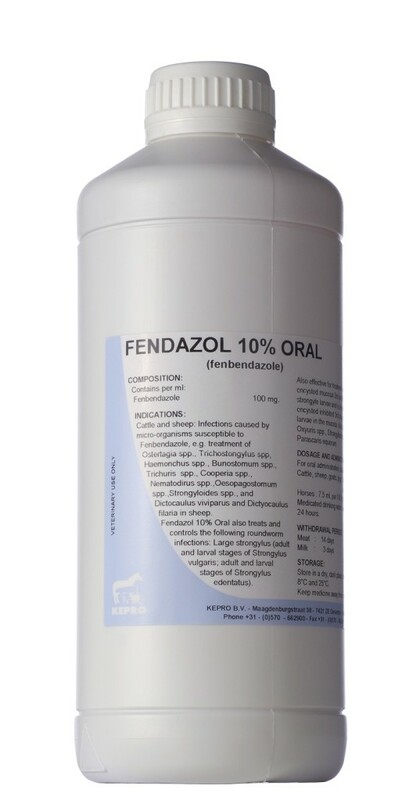 Fenbendazole also treats and controls the following roundworm infections: larger Strongylus (adult and larval stages of Strongylus vulgaris, adult and larval stages of Strongylus edentatus). Fenbendazole is also effective in treatment and control of encysted mucosal 3rd and 4th stage small Strongylus larvae and against encysted inhibited 3rd stage small Strongylus larvae in the mucosa. Adult and immature Oxyuris spp., Strongyloides spp. and Parascaris equorum. 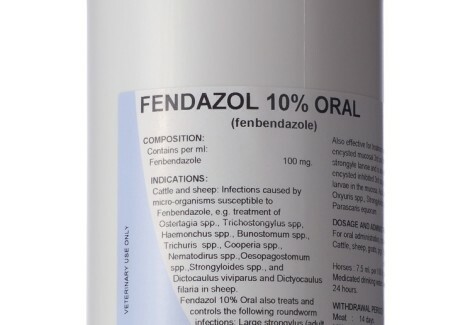 Fendazol 10% Oral is indicated for the treatment of mature and immature stomach, intestinal and lung worms and eggs in cattle, horses, sheep, goats and pigs. For oral administration via drinking water. Shake well before use. Cattle, sheep, goats, pigs : 5 ml per 100 kg bodyweight. Horses : 7.5 ml per 100 kg bodyweight. One time treatment, repeat in case of re-infections after 3 – 4 weeks.